I imagine this was said tongue-in-cheek, but at it's core, they play two completely different ways. Mayael's a control deck, Gisath is a beatdown deck. Mayael wants to cast her own wraths. Gisath wants to see none. Card quality (like Inkeyes22 says, above) is definitely in favor of the Mayael deck. 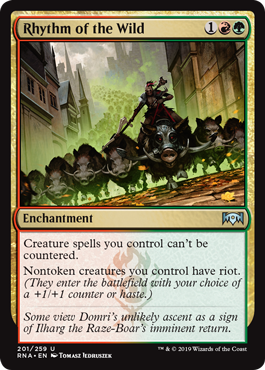 There's such a huge selection of large creatures in Naya colors that 'very good' creatures are getting sidelined for ones that are truly great (and this is coming from someone with even more fat critters in their deck than most Mayael players). Compare that to one block (and a few one-ofs from older sets) of Dinosaurs. There is certainly something viscerally satisfying about crashing in for 7 with a giant dinosaur, though. Today I was reminded of the importance of playing special lands in my Mayael deck. This is the end game of a 4.5 hour game. I pumped one opponent's 10/10 Vulturous Zombie to 16/14 by creating a kobold with Kher Keep that died to another player's Crovax on the turn before mine and on my turn, cracked a Wooded Foothills, cycled an Eternal Dragon and pumped it with Slayers' Stronghold, before giving it double strike with Sunhome, Fortress of the Legion to have it deal the exact 32 damage needed to kill another opponent. Vulturous Zombie guy wants to come for me next, Mayael had failed me both earlier activations, but I played her once more on my turn as a last resort and with the Stronghold I activated her before VZ guy could declare attackers and like a champ she dug up Blazing Archon. I feel a good hit was deserved after the failed earlier attempts. Next I draw a big guy with trample off the top and it's enough to kill VZ guy with the haste from the Stronghold through his only blocker. The last remaining player Wraths, we end up in a bit of a standoff. I manage to get Gisela, but her last card is some Oblivion Ring with flash, Stronghold and Sunhome would've made Gisela lethal. Unfortunately we couldn't finish the game as the location was closing, but the Stronghold and Sunhome combination would've made almost anything lethal. Additionally Kor Haven and Winding Canyons were great until they were taken out by other players while both Forbidding Watchtower and Stirring Wildwood chump blocked to allow me to live another day. In other news: I may be playing more regularly. Did I miss anything since Shadows Over Innistrad that I should absolutely be playing? I recommend Rishkar's Expertise. Note you draw before choosing the card you cast, so it might be one of the cards you draw. If we're also looking at commander set cards here then there's Traverse the Outlands. Both of these are probably exceptional in a Mayael deck. Heroic Intervention is also a new wrath insurance card. I have a bit of a strange Mayael deck in several ways. I play a large number of mass removal spells and am perfectly fine with losing fatties to them, so the Intervention and Protection wouldn't make the cut for me (though if it comes on fatties I would consider it). I play it fully highlander, so not many basics to search for with Traverse. The Expertise seems overkill when you're already trying to cheat fatties into play. Thanks for the suggestions though, they do see interesting for some builds. I do like Hour, but WWW may be a little challenging in the early game and it only destroys (I often find myself challenged by indestructible and otherwise difficult to remove permanents). I am no longer playing Planar Cleansing, so it's not likely going to cut it. Perhaps if I ever want to up the amount of mass removal that hits anything. I also think the Swordtooth is very interesting. It's hard to find fatties that come out early for a Mayael deck. On the other hand I don't often find myself in need of acceleration. I could see a build that tries to speed past opponents with smaller fatties and this would fit really well there. I could also see a meta that requires acceleration just to keep up with the other decks, but I haven't yet come across such a meta. I'm curious what I find for myself going through the sets. I have no clue why those Chinese cards show up though. The search parameters are by color identity and after a certain year/set and those are new naya cards. Bad news: tokens aren't cards. But I agree about the value of utility lands, at least in certain decks. Good point! Nobody realized it said cards.